While dock boards and dock plates are similar products, they have defining characteristics that make one or the other more appropriate for your application. For example, dock boards handle higher capacity loads. Dock plates, in comparison, are better suited for lower-capacity equipment. Furthermore, though either can use chains as a lifting device, a dock board can also use lift loops. Dock plates, on the other hand, use nylon straps as the preferred alternate lifting method. Finally, both dock plates and dock boards are made from either steel or aluminum depending on the specific application. Keeping those differences in mind, let’s determine which piece of equipment you’ll need. To take the guesswork out of choosing a dock board or dock plate, we’ve created a helpful step-by-step guide. 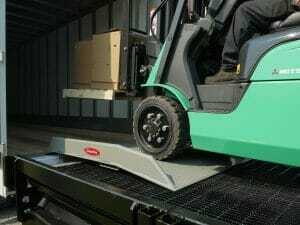 If you’ll be using a fork truck, you’ll need to go with a dock board that can handle higher capacity loads. 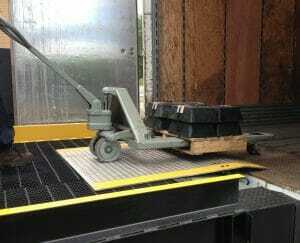 If you’ll be using pallet jack, dollie or cart to carry loads from a truck, you should go with a dock plate that’s suitable for lower capacities. The necessary length of your dock board or dock plate is determined by the maximum amount height difference between the dock height and the floor height of the trailer(s) being serviced. So if the Truck Height is 54 inches and the Dock Height is 48 inches, the Max Height Difference is +6 inches. From here, use the table below to determine the dock board or dock plate length. But what if the Truck Height is lower than the Dock Height? In that case, you have two options. The dock board (with chains instead of lift loops) or dock plate must be used in reverse, with the board or plate will be in the truck and the lip on the dock. Raise the truck bed with wheel risers. Copperloy recommends a minimum width of 60 inches for dock boards that will be used with forklifts, and a width of 54 inches for dock plates used with pallet trucks. Also remember that safety curbs take up 6 to 8 inches of usable space depending on the dock board. Still have questions? We’re here to help you choose the right loading dock equipment. Contact us today.